The number of assisted people at Arrels has increased again. In 2018, we assisted 2,341 people, a 23% more than in 2017 and a 72% more than five years ago. Most of these people have come to us looking for basic services and asking for orientation. There are a lot of challenges because the number of people that live on the street in Barcelona increases and it is difficult to have access to housing at an affordable price. The figures we explain here below make reference to 2018 but they are still provisional. Around March, we will publish the final figures along with the annual memory. Throughout 2018, at Arrels we have assisted 2,341 homeless people. It is a figure that, for many years, doesn’t stop increasing and that, only comparing it to 2017, means a 23% more of people. Of the 2,341 that we have assisted, we met for the first time more than a thousand of them during the last twelve months. We have assisted every one of them in a different way: visiting them on the street, offering basic services like a shower or a stable place to keep their belongings, guaranteeing housing, listening to them and orientating them about the resources that exist in Barcelona where they can also find help, etc. The Arrels’ street team has visited 523 people in 2018. There are people with a chronic street situation and people we have visited more than once throughout the last twelve months, to know how they are doing, what they need and creating bonds of trust that allow them to transform this situation. The number of people assisted at Arrels has increased especially at the open centre, where people can have shelter and find basic services. 1,941 people have been at the open centre throughout 2018, which means a 24% more than in 2017 and a 91% more than five years ago. Of all those people, 843 have used the shower services and more than a thousand have used the wardrobe. In many cases, these sanitary services have offered themselves occasionally to people who come to us because they are processing the access to municipal centres and, meanwhile, they need to have a shower and change their clothes. It should be noticed the fact that the cloakroom service has been at its maximum throughout the year and has offered a stable place to leave the belongings of about 900 people. In Barcelona, there is not any other stable cloakroom municipal service. From the open centre of Arrels, we have also tried to give an answer to more than 1,360 homeless people that asked for help when having to shower, changing their clothes or having an access to housing. 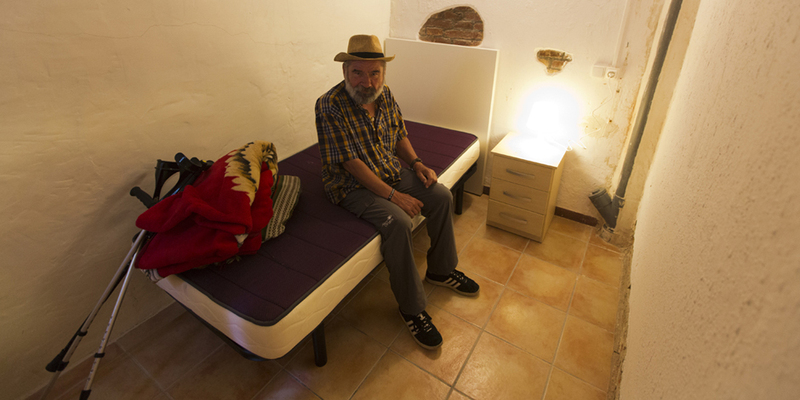 In most cases, we could offer an answer to basic needs but in many other occasions, we just could listen and orientate the person about the current resources that exist in Barcelona for homeless people. In the city of Barcelona, there are thousands of people living on the street, according to the last night recount organized on March of 2018. It is a minimum figure and in the last ten years has increased by a 45%. The increase of the homelessness situations also matches with the complicated reality to have access to an affordable housing. In that sense, from Arrels we have guaranteed housing to 237 people that have lived on the street. We have been able to do it with individual and shared flats -where live more than the half of the people we give housing-, with the Pere Barnés residence -that accommodates homeless people with frail health-, with rent rooms and with two low-requirement spaces that throughout 2018 have been consolidated. More and more people believe that achieving #nobodysleepingonthestreet is possible. Thank you for joining us! 387 volunteers have collaborated in the healthcare services but also in administrative, maintenance or sensitization tasks. 4.703 partners and donors have contributed economically to take forward Arrels’ work. 4.180 students have participated in sensitization talks to know more about homelessness. 254 companies and a hundred of special initiatives have done your bit.